Juventus coach Antonio Conte has described Roma boss Rudi Garcia's claim other teams do not give 100% against the Serie A leaders as "bar talk". Juve need five points from their final four matches to win their third straight Scudetto under Conte. "I was taken by surprise by his comments," said the ex-Italy player, whose team go to Sassuolo on Monday. "The words of Rudi Garcia are very provincial from every point of view. I categorise them as bar talk." Garcia made the comments after Roma's 2-0 home win against AC Milan on Friday lifted them back within five points of Juve. The Giallorossi set a Serie A record by winning their opening 10 matches of the season, but they handed the title initiative back to Juventus after managing just two wins in eight matches either side of Christmas. However, Garcia's side have won their last nine league games to maintain the pressure on Juve. Juventus have conceded 11 goals in the league since the beginning of 2014, fewer than any other team. 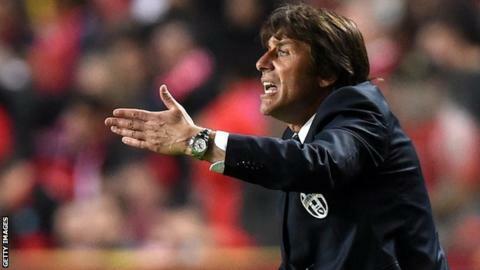 "We've been at the top for three years and everyone who plays us treats it as the match of their lives," added Conte. "I find these words to be a lack of respect to other coaches, to their players and to the clubs who are fighting for survival. "I don't think Serie A needed Garcia to bring new motivation to teams facing Juventus."